Located on the northern coast of Iceland, Akureyri is a historic fishing town and the largest outside of Reykjavik with 16,000 inhabitants. 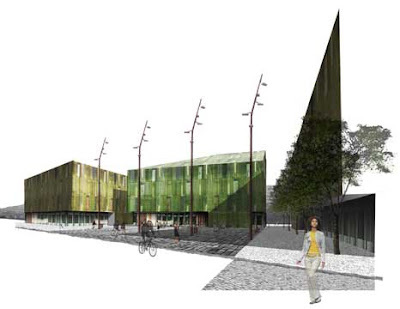 Graeme Massie Architects were awarded first place in a 2005 design competition with their plan envisioning the town centre as a vibrant mixed-use area. 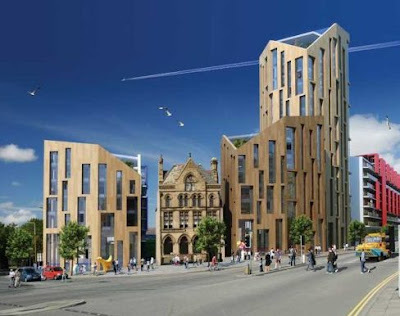 Alison Brooks Architects have recently revealed images of an urban housing development proposal for Great George Street in Liverpool. 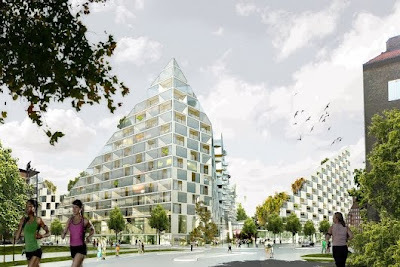 BIG has recently won an international design competition for the World Village of Women Sports in Malmø, Sweden. 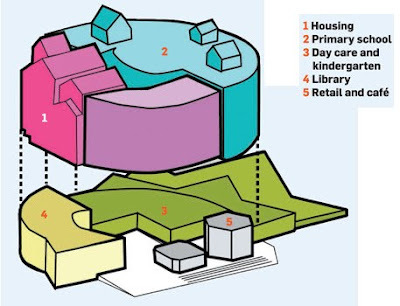 The project which occupies an entire block is sloped reducing the scale to adjacent buildings as well allows light to penetrate the landscaped interior. 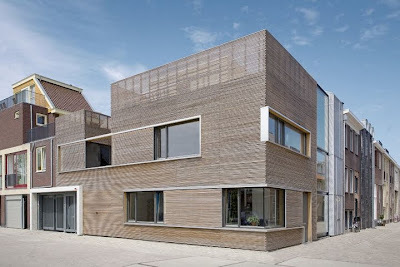 This urban residence in Nieuw Leyden, Netherlands by architects Pasel Künzel is set in a masterplan designed by MVRDV. 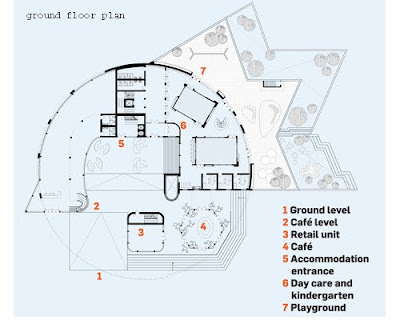 The design raises the garden to the second floor with the open floor plan built around it - blurring the relationship from inside out and further stated by the interruptions in the brise soleil. 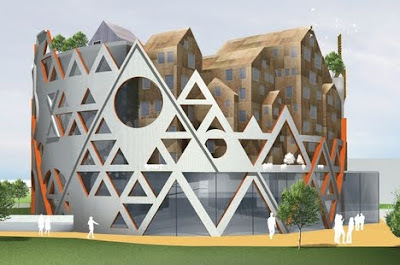 Coop Himmelb(l)au have recently presented the final scheme design for the 1300 seat House of Music to be located in Aalborg, Denmark. 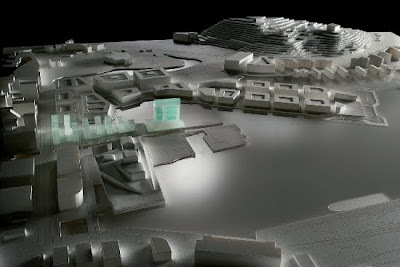 The architects were awarded first place for the competition to design the 18,000 sqm cultural and educational facility back in 2003. 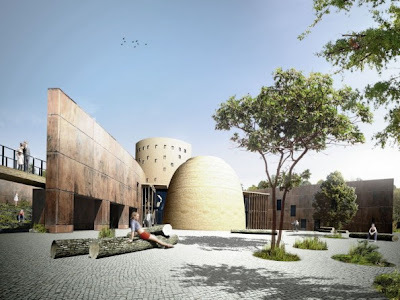 OVO Grabczewscy Architekci has designed the Museum Yatenga to be located in Silesia, Poland. The proposed museum when complete will house the cultures of the world exhibition, in an open, interactive public space that is both about the works on show, as it is about gathering and socialising. 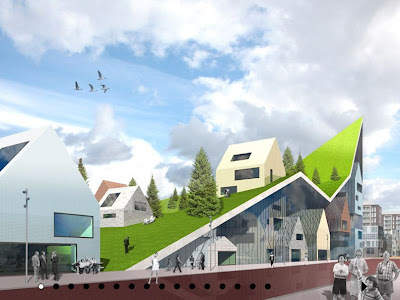 A design by Herreros architects inspired by a Edvard Munch quote has been awarded first prize for the Munch Museum and the Stenersen Art Collections competition in Oslo, Norway. I am more interested in the line, its rise and fall, than in color. 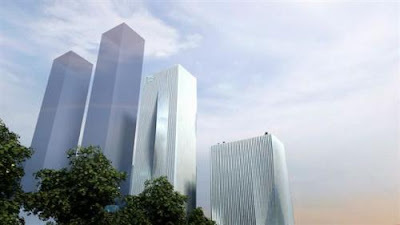 BIG, in collaboration with ARUP, have been awarded first place in an international competition, to design the Shenzhen International Energy Mansion - a pair of sustainable towers to house the regional headquarters for the Shenzhen Energy Company. 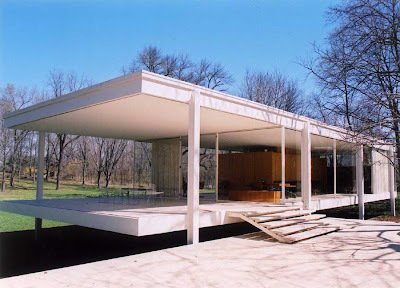 Built between 1946 and 1951 as a weekend retreat for a wealthy client, the Farnsworth house was one of three residences in the United States by Mies van der Rohe. The house was designed as an extension of the landscape with its emphasis of the horizon and floor to ceiling panes of glass. 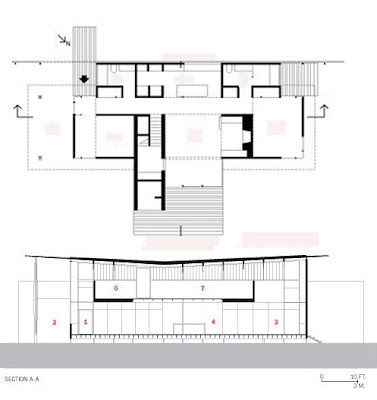 And from the deceptively simple floor plan and section emerged endless spatial possibilities. the skyscraper index | £70,000 paper tower | Not just for kids, pop-ups for architects | branding architecture | closed for repairs | blueprint walls | architects call for slower, balanced approach to construction | architecture that imitates life | re-imagining Boston's stalled projects | remember BIG? 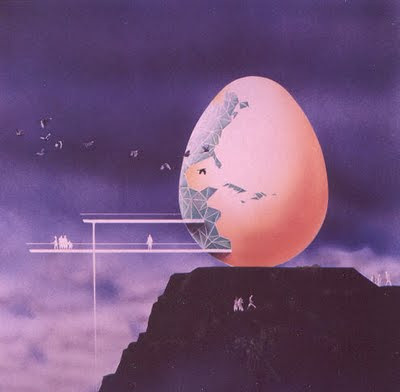 The architecture of our future is not only unfinished; the scaffolding has hardly gone up. 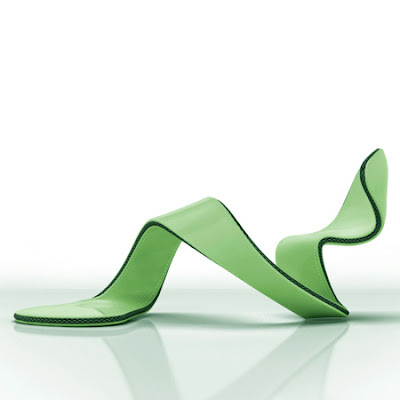 Studio Banana TV interviews celebrated Spanish architect Juan Herreros, studio Ábalos & Herreros. 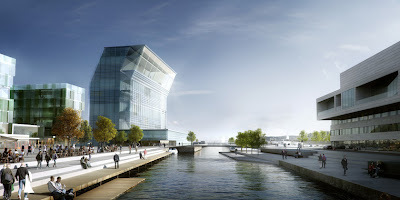 He now directs since 2008, Herreros arquitectos that was recently awarded first place for an international competition to design the new Munch/Stenersen Museum in Oslo, Norway. 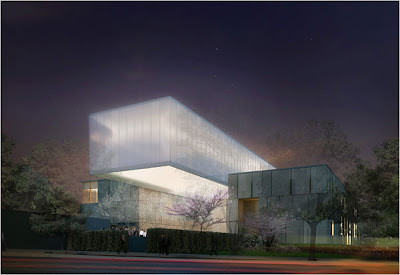 The renown Barnes art collection, will in 2012 move to a new Tod Williams and Billie Tsien designed structure in Philadelphia’s museum district. Interesting the project is being met with heavy criticism even before the foundation has been cast. 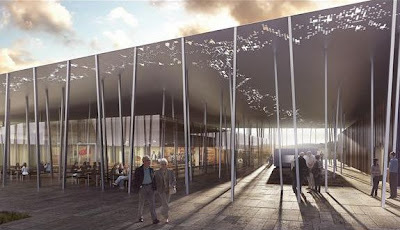 Architects Denton Corker Marshall have revealed images for a visitor's centre at Stonehenge. 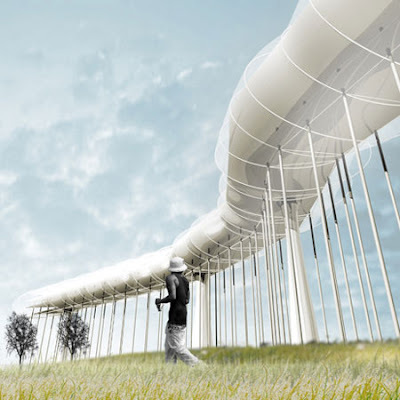 The design features a perforated canopy delicately balancing on a forest spindly columns. 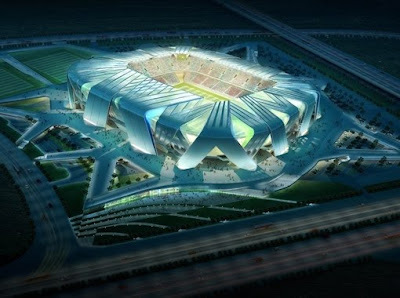 Completion date is planned for 2012, in time for the London Olympics at a cost of £27.5 million. Unstudio has won a limited competition for a 40,000 seat football stadium for Chinese Super League club Dalian Shide FC.The inspiration for the design for the skin of the stadium originates from traditional footballs made from layers of bamboo. 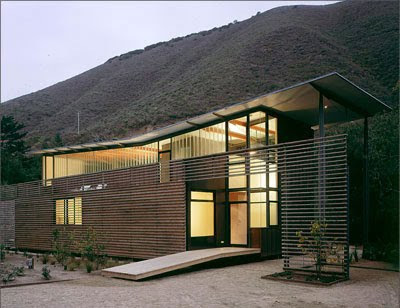 Big Sur is a 2500 sf vacation home in the canyons of northern California. Designed by Anne Fougeron of San Francisco based architects Fougeron Architecture as a discrete object in the landscape the exteriors are finished in stucco, copper and in some cases covered in timber screens. The best architecture comes from a synthesis of all the elements that separately comprise a builing, from 1) its relationship to the streetscape or skyline to 2) the structure that holds it up; 3) the services that allow it work; 4) the ecology of the building; 5) the materials used; 6) the character of the spaces; 7) the aesthetic dimension and the beauty of light and shade; 8) the symbolism of the form; and 9) the way in which it signals it's presence in the city or countryside. Hong Kong based architects Cheungvogl have designed a research facility in Chicago to be built on stilts to preserve the secrecy of the operations with the reception and administration located below ground level, overlooking a nearby lake. Tori-Tori a successful Japanese restaurant in Polanco, Mexico City is moving to a Rojkind Architects and Hector Esrawe designed location. 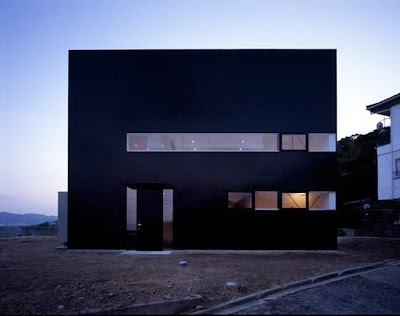 The building is rendered in a blackened water proof material typically used in boat building, the result is structure that contrasts visually but responds to it's climate. 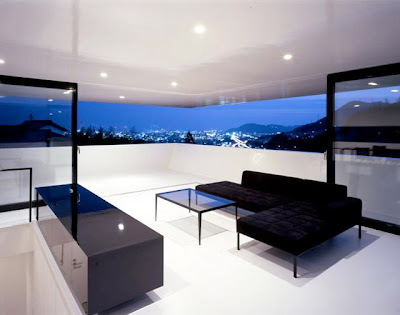 The view out is reinforced by the contour of the roof, and the seemingly near wall-less interior. 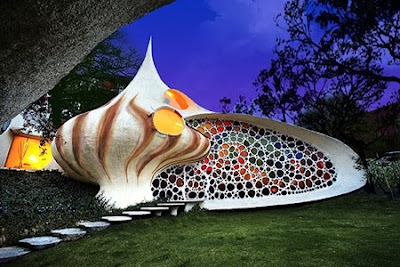 Architecture is being invented just like one invents a car or a plane. It has no boundaries and can be exported like any other creation. 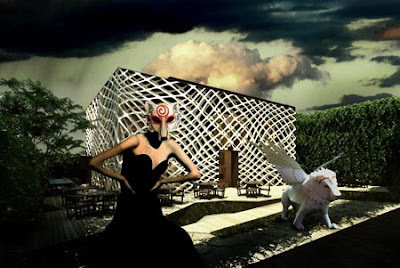 Sites never compelled a predetermined architecture. Architecture has no public interest but private, except for some public buildings or monuments. It is the synthesis of all arts including every discipline and in that regard it should be free and should only obey to technical constraints, security, hygiene and land planning. But Human beings have a different judgment. Deep frozen in the past and crazy about tradition, they added such useless constraints that any evolution seems to be impossible. 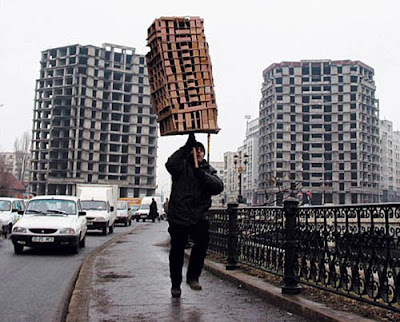 Housing is yet the basis cell of any society is currently the only field where progress, especially in France, is almost impossible, in the global indifference of users and most of architects. 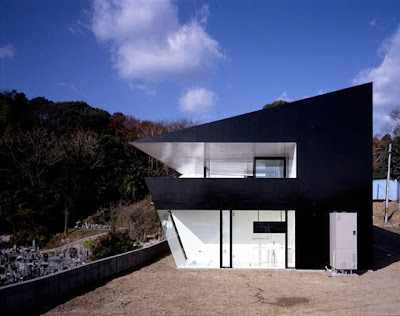 I'm totally into architecture for all strata of society...high design should not just be for rich people. Architects LOT-EK have proposed a re-use of Pier 57 in New York's Hudson's River. 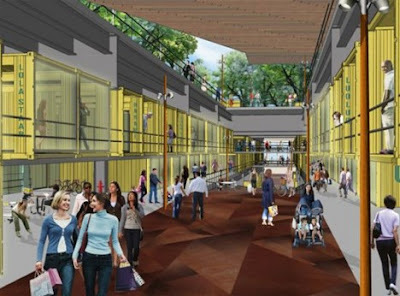 The derelict concrete mass will be transformed into a mixed use facility of artists studios made entirely of shipping containers, with an open-air market and rooftop park above. the Taichung Convention Centre in Taiwan by Chinese based architects MAD. 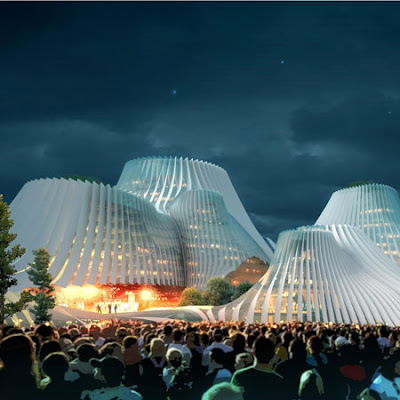 The architects drew heavily from the context of the landscape and have proposed a building that resembles a series of snowy mountain peaks or perhaps a number of pleated skirts. 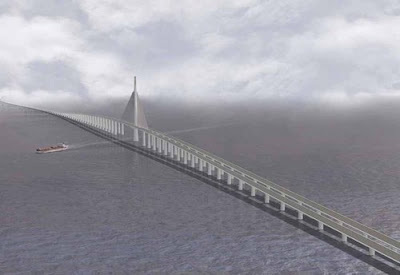 The bridge when complete 2015 will span the 13 miles between Bahrain and Qatar at a cost of U$3 billion.